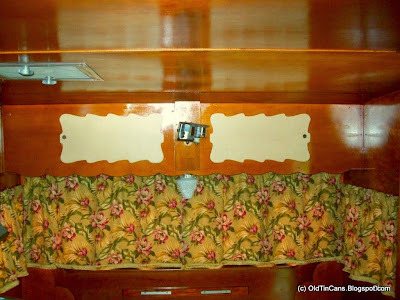 A blog about old travel trailers that we have refurbished, showing before and after photos. The dinette seat upholstery - completed, but not attached to the wood frame yet. (Curtain fabric is sitting on top). 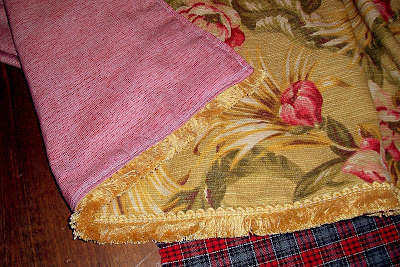 Duck cloth is sewn on (top stitched) down the middle of the seat fabric. It tucks in between the seat back and the seat to secure tightly to the frame. My particular piece was the width of the seat x 18" - divided in half at 9" - then sewn to the bottom of the upholstery fabric at 16 inches down. Here you can see the duck cloth sticking out the crack in the back between the two seats - not secured yet. Prior - with lining attached. Close up of back of seat detail - red is darker than in picture. Side gusset - upholstery is still loose from the seat frame. Fitting the sewn seat upholstery. #1 - The top of the seat and back rest (the largest square). #2 - The accent piece (red upholstery fabric in this case). 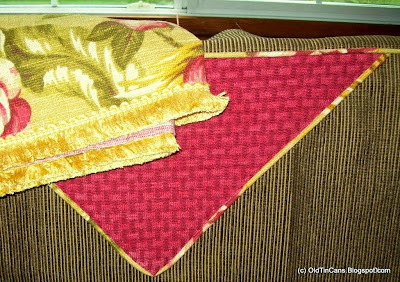 #3 - A long strip for the sides (front) of the seat. #4 - A long strip for the sides (top) of the back. #5 - A piece of duck cloth the width of the seat by approx. 18" is sewn down the middle (at the 9" mark to the correct area and is attached to the back to slide in between the seats to secure the crevace between them to the frame - this is what will keep it looking upholstered and tight instead of a "slipcovered" look. 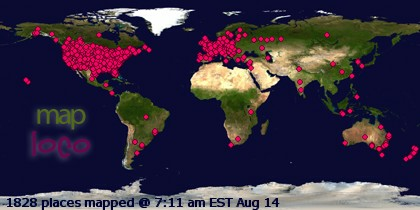 (photos above about that). #6 & #7 - Side gusset pieces (2). Gusset - tacked on, not sewn down yet. 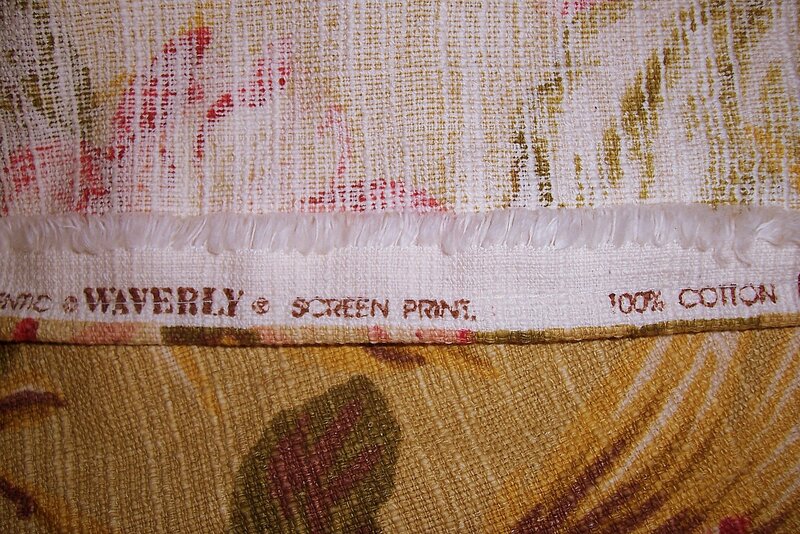 This "Malibu Palm" Retro Floral Upholstery / Drapery Fabric is by Waverly. 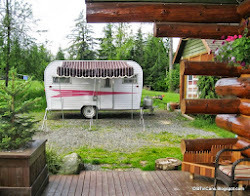 The Shasta required 10 yards x 54" wide, as I made them very full. 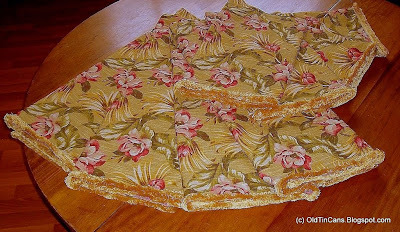 I washed and dryed the fabric on high heat prior to sewing - yes, it shrinks! It shrunk 2" in width and 3" per yard in length. I did do a test yard first, because sometimes the manufacturer means it when they say "Dry Clean Only". I decided that since this fabric was 100% cotton, there was no good reason to not wash and dry it on high and see what happened. Another thing washing accomplished was making the fabric appear even "nubbier" and older. This was exactly the appearance I was going for. The gold brush fringe is a must for this look - it gives it that "authentic retro" appearance in my opinion. Here are the front curtains, shown drawn. The lining really does help block the light, and protect the fabric from fading as well. I would always suggest lining your trailer curtains. 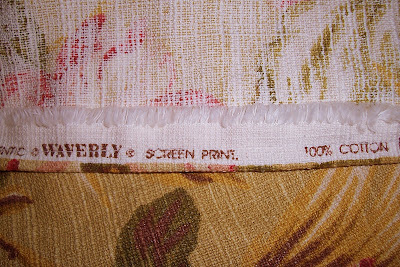 The drapery lining fabric is a light pinkish red and white acetate in a basket weave pattern, and was used for all of the tie-backs as seen below as well. Here We Have a Heaping Helping of Curtains. It looks like they could have come straight out of Lucy and Ricky Ricardo's place. 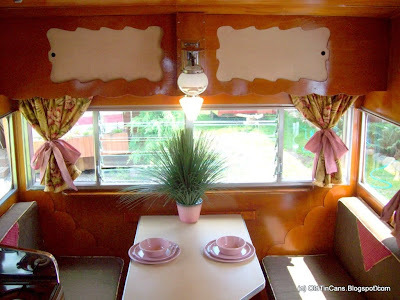 Vintage 50's Tropical....The flowers and palm fronds are fabulous! This is one of my all time favorite favorite fabrics! The selvage edge - and a close up of the weave of the fabric - it is nubby and has a nice thick feel to it - it really does resemble vintage barkcloth. 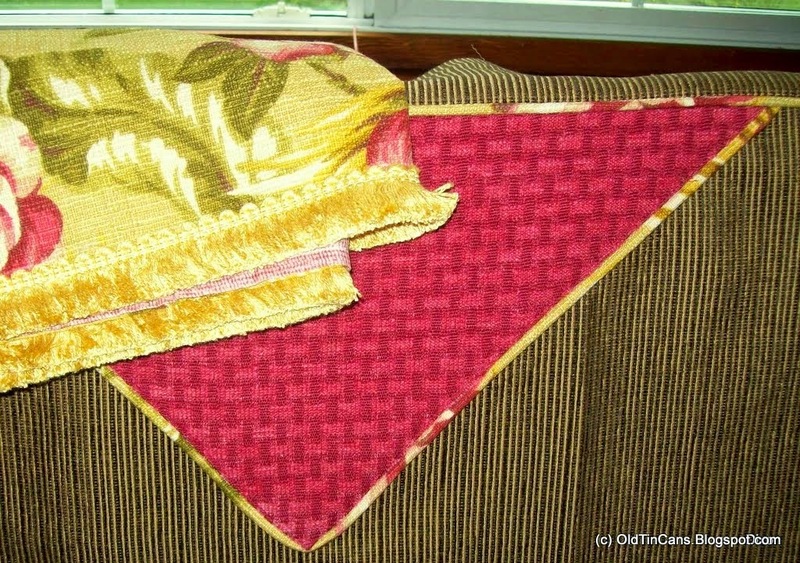 And here they are shown with the cushion fabrics - A raspberry chenille basketweave for the chevrons, and accent trim pieces, and a chocolate brown cord upholstery fabric for the main body of the cushion covers. 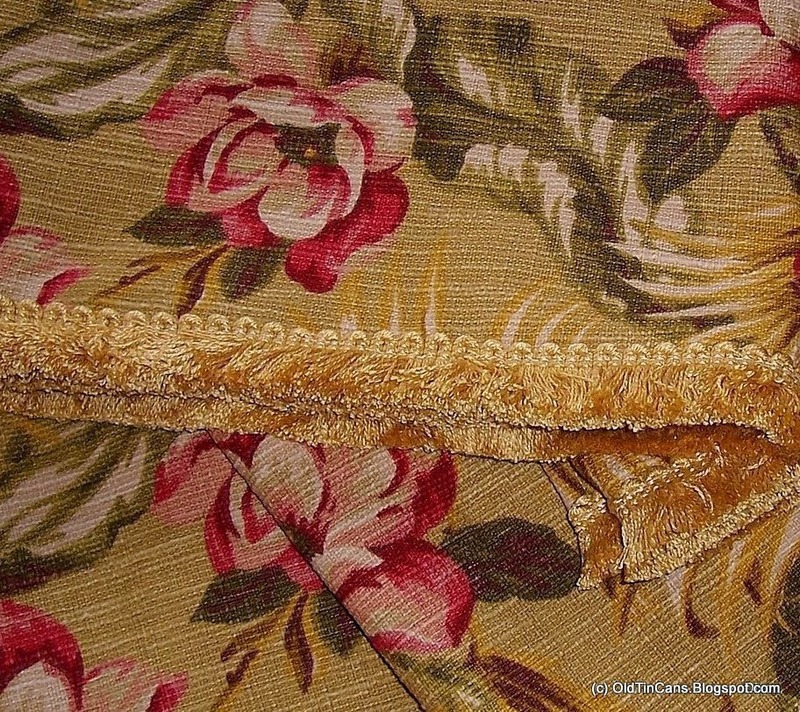 I also used the curtain fabric to make the cording shown on the chevron below. 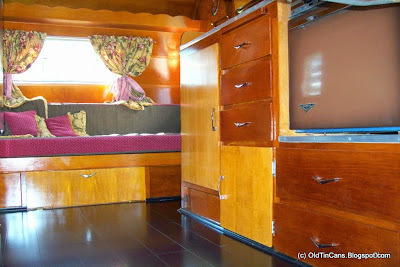 Still sewing the dinette covers in this photo. (I will upload another post on the cushions shortly). 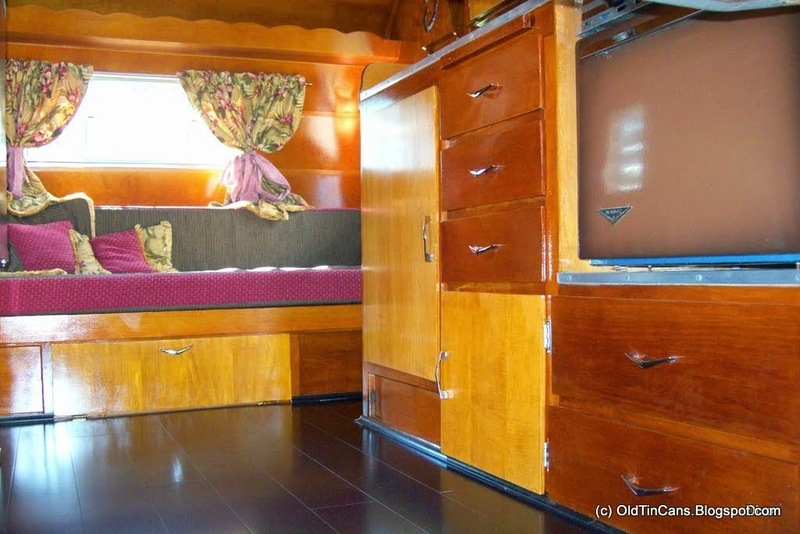 With the rear bed cushions below. Thanks for looking, and Happy Camping!